Sanissimo in Italian means Healthy, and the Sanissimo tostadas are oven baked instead of fried so they do not have oils and fats. The Sanissimo tostadas are aimed for those who like to pamper themselves while taking care of their health. Sanissimo offers families, high quality, healthy, delicious and convenient products, due to its unique manufacturing process with natural ingredients. 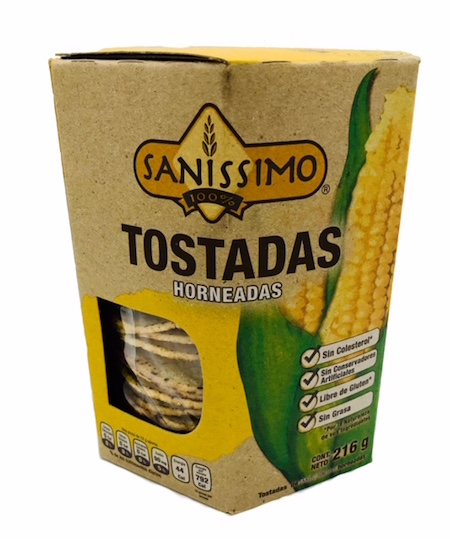 Sanissimo corn tostadas have authentic traditional tortilla flavor, are made in Mexico, 100% oven baked, crunchy, fat free and are the first packed in a box, with an original presentation that calls for confidence in environmental care and therefore health. Sanissimo tostadas have the benefit of being oven baked not fried, made with nixtamal corn and they do not contain Trans fat acids, its gluten and cholesterol free, with no artificial coloring or preservatives. Sanissimo oven baked tostadas are aimed directly at those workers who are always on the run, do not have time to cook and are looking for easy, fast and delicious options to eat. Make delicious and healthy meals your whole family will love with Sanissimo oven baked tostadas. It is an honor to be at your table! Sanissimo is the only tostada with the traditional flavor of Mexican tortillas. 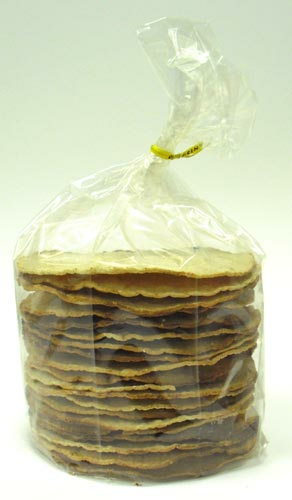 Since Sanissimo Tostadas are oven baked they absorb liquids quickly. Make sure to addthe toppings before serving. Use Sanissimo to make delicious chorizo, chicken, tuna or cebiche tostadas, andpour over your favorite salsa for a finger licking meal! Break tostadas and eat like tortilla chips with refried beans. Since Sanissimo Tostadas are baked they quickly absorb liquid, so make sure to make your tostadas right before they are going to be eaten. For longer lasting flavor make sure to keep your Sanissimo tostadas package tightly closed and away from direct sunlight in a dry, cool place. Ingredients: Corn masa flour, Sea Salt, Tocopherol (natural antioxidant). Las Tostadas Horneadas marca Sanissimo son un producto dirigido aquellos a los que les gusta consentirse mientras cuidan su salud. Sanissimo le ofrece a las familias convenientes productos de alta calidad, deliciosos debido a su proceso de fabricacion unico con ingredientes naturales. Las tostadas de maiz de Sanissimo tienen el autentico sabor tradicional a tortilla, hechas en Mexico, 100% horneadas, crujientee, bajas en grasa y son las primeras empaquetadas en una caja. Sanissimo tiene una presentacion original que exige confianza en el cuidado del medio ambiente y por lo tanto la salud. Las tostadas Sanissimo tiene el beneficio de ser horneadas no fritas, hechas con maiz de nixtamal y no contienen grasa trans, esta libre de gluten y colesterol, sin colorantes ni conservantes. Las tostadas horneadas de Sanissimo son dirigidas directamente a aquellos trabajadores que siempre andan corriendo y buscan opciones rapidas, faciles y deliciosas para comer. Haga deliciosas y saludables comidas que a toda su familia le encantaran con las tostadas horneadas Sanissimo. Es un honor estar en su mesa! Como las tostadas Sanissimo son horneadas, absorben los liquidos rapido. Asi que le sugerimos preparar las tostadas solo hasta que vayan a ser consumidas. Use las Tostadas Horneadas Sanissimo para hacer deliciosas tostadas de chorizo, pollo, atun o cebiche, y cubre con tu salsa favorita para una comida para chuparse los dedos! Rompe las tostadas en pedazos y disfruta como chisps de tortilla o totopos con frijoles refritos. Sin Conservantes o Colorantes Artificiales. Hecho con 100% Maiz Blanco Mexicano. Empaquetado en bolsa de polipropileno ecologica. Como las Tostadas Sanissimo son horneadas y absorben los liquidos rapidamente, ?asegurate de usar las tostadas hasta que vayan a ser consumidas. Para mantener las tostadas frescas por mas tiempo, mantenga el paquete de tostadas bien cerrado, y lejos de la luz en un lugar oscuro y fresco. Ingredientes:Harina de Maiz nixtamalizada, Sal de Mar, Tocoferoles (antioxidante natural). I found these while on vacation in Mexico and had to order some when I got back to the US. These are incredibly delicious tortillas with no added oils or fats. I don't know how they do it, but the tortillas have a nice rich smoky flavor that complements any dip or Mexican dish, and they taste as good or better than any oil drenched fried chip. I would love if they would also sell these in bags of chips for dipping. If you try to avoid added fats and oils in your foods, these are the only game in town. Just wish they were available in the US and a bit less expensive. these are great.. a big part of my diet. Crunchy. Very low fat. Never stop carrying them. I tried this tostadas in Mexico City for the 1st time and love them. They are light, non greasy and healthier than all the rest of the tostadas in the market because they are the only ones that are oven baked instead of fried. They are thin and crispy and go with anything. I'm a big fan!